Here’s something to soothe that Monday morning madness…. I’ve made a few small changes to the blog, and will be doing more in the future. When I started out, I thought the moniker “Ms. Pearl” was a good match for “Pearls and Prose.” Now I’m growing weary of it and will be switching to my first name today. 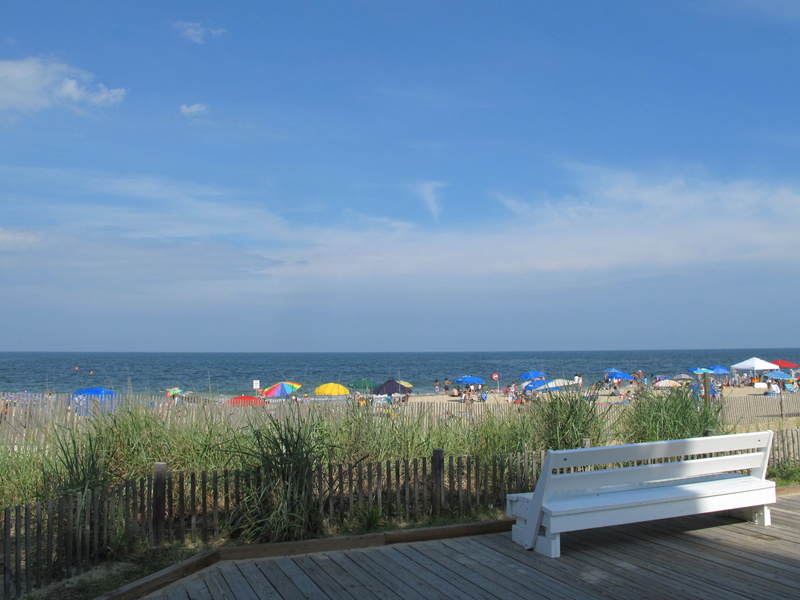 This entry was posted in photography and tagged Atlantic Ocean, beach unbrellas, boardwalk, Delaware, Rehoboth Beach, white wooden bench. Bookmark the permalink. Gorgeous day. Love all the colorful umbrellas! Thanks, Mindy. I really appreciate the retweets too! Wouldn’t mind sitting on that bench. I’m sort of glad I chose to use my real name. I see quite a few people changing their nom de net lately. Maybe one grows out of it. “Nom de net”–love that, Caroline! When I first started the blog, my husband and I were concerned about privacy. Now I’m more comfortable, and realize I’ll need to use my real name if I ever sell any of my work. I still have Ms. Pearl on my flickr account, but that may change too. An evolving process for sure. Excellent to finally find out your real name! I tend to think of your blog as more pictures than prose, and this one is as beautiful as ever. Hey, thanks for dropping by. I’m afraid I’ve been an absentee commenter the past few months. Will try to remedy that soon. Yes, this has pretty much evolved into a photography blog, which is fine with me. I don’t know how you continue to come up with great writing week after week. My hat’s off to you, MLS. Thank you, Jeanne. I could go for that right now too. I think it’s just about impossible to feel bad next to the ocean. Oh, Monday’s and reality! I can smell the ocean when I look at this view; feel the bench as I stretch out … thanks, Carole. Anytime! How’s the weather up north, Cheryl? HOT! Sorry I’ve been silent for a while. Incredible things going on here. I’m on Cloud 9 … after three years of searching we finally found and purchased land to build on with road access on the same lake in (near) Northern Ontario where my cottage is located. The land purchase closes tomorrow. There’s a cabin on the land where we can stay on weekends while the work is underway. Cabin renovations start tomorrow. No longer any need for my little, island cottage. It sold to a lovely young family before I could nail the sign to the dock and closes August 26th. When the construction is done, we will move permanently to the lake!!!! A dream come true. I’m dizzy with excitement. I’d like to start a new blog about it, but am too wild with joy to concentrate. Oh Cheryl, how wonderful!! Hope you share some photos! Any idea how soon you’ll be able to move in? Gorgeous shot! I love all the colourful umbrellas! I was actually somewhere similar today, I love being beside the sea, all the colours, the smell of the saltwater and the waves. It’s so peaceful. I couldn’t agree more. It was so nice living near the ocean in California. Oh Cheryl, looks like a photographer’s paradise. And do take photos of the construction! You’ll look back and marvel. Thank you. It’s a great beach.